St Benet's Abbey was originally founded on an island called Cowholme in AD 800. The current remains are part of the Benedictine foundation that was endowed in 1020 and was combined with the Bishopric of Norwich in 1539. These remains include a 14th century gatehouse encased in an 18th century windmill tower, parts of a precinct wall and ruins of a church. The church was extensively rebuilt in the 14th and 15th century. There are also earthworks of monastic buildings south of the church, an earlier monastic boundary, a series of elaborate fishponds and a range of monastic buildings on the edge of the river. Cropmarks of further buildings at the site are visible on aerial photographs. The abbey and windmill were a common subject for painters of the Norwich School. A Late Saxon lead tablet inscribed with Scandinavian long-twig runes has been found at the site. Related pdf file: S. Heywood Report, Precinct Wall St Benet's Abbey, Horning. On island called Cowholme. First founded AD 800. Remains are those of Benedictine foundation endowed 1020 on Saxon site. Granted to Bishop of Norwich 1536. Church remains consist of the north wall of nave and north transept, slight remains of nave south wall, cloisters and chapter house, fragment of west tower. Gatehouse stands further west and is a fine piece of late 14th century work with niches on the buttresses and figures in the spandrels depicting a monk and a dragon. Post medieval windmill was built over the top. Range of monastic buildings ran along river south of the church. Erosion has removed most of these. The Chequers, an inn, survived here until the 19th century. Precinct wall. Stubs of precinct wall remain by gatehouse. Foundations remain along east side of island. Fishponds north of gatehouse and river dock to south. Whole island scheduled. Gatehouse listed grade I, church remains II*, riverside buildings and precinct wall II. 1936. Casual find. From the river bank. Complete Middle Saxon/Late Saxon pot. 1938. Casual find. Dredged from river. Medieval pottery, lead and ventilating tile. 24 March 1968. East Anglian Aqua Club examination of riverside structures. Rectangular flint structure at south end of Abbot’s rooms and part of Almoner’s house examined. Worked limestone blocks recovered. 1973. Found in consolidating river bank. Post medieval tiles including malthouse tiles, animal bones, worked stone. 21 August 1975. Visit. Consolidation work in nave. Fragment of wall face disappearing under north nave wall’s south face. May be remains of earlier church or more recent underpinning. Damage to church by burrowing animals. Erosion reveals more of riverside buildings. 1977. Found in molehill. By fishponds. 1977. Metal detecting. In mud on north river margin level with church. Lead pilgrim badge in form of ampulla. Base sherd of 16th century stoneware jug. Rim sherd of 17th century slipware dish. Brickwork repaired on gatehouse mill. Rabbit wire laid in the church. Summer 1980. Casual find. In east end of chancel. Floor tile with dark green glaze. Spring 1981. Casual find. North of church. Early medieval T-shaped woodworking axe. June 1985. Casual find. From eroded riverbank. Lava quern fragment with tooling marks. July 1990. Casual find. From bed of fishponds. Medieval to post medieval sherds. Including Raeren base. Site sold to Crown Estates. Artefact collection from molehills by Norfolk Archaeological and Historical Research Group (NAHRG). Eight areas examined. 1 undatable prehistoric flint flake. 1 ?Early Neolithic flint ?small leaf arrowhead. 3 medieval pottery sherds (unglazed). 5 medieval or later flint flakes, probably knapping waste associated with construction or repair of the Abbey buildings. 9 medieval/post-medieval pottery sherds (7 LMT, 2 stoneware). 2 post-medieval pantile fragments and 2 clay tobacco pipe stems. 1 undatable lead disc and 2 lead offcut fragments, 15 iron nails, 1 rectangular iron object, oyster shell and bone. 1 medieval pottery sherd (glazed Grimston). 2 medieval/post-medieval pottery sherds (stoneware), 2 roof tiles and 3 brick fragments. 10 medieval or later flint flakes, flake fragments and spalls. Also likely to be relatively recent knapping waste. 7 post-medieval pottery sherd (1 stoneware, 6 Glazed Red Earthenware). 1 undatable iron ring fragment, 8 iron nails, oyster shell, slag and charcoal. 1 medieval/post-medieval brick fragment, 1 roof tile and 1 ?roof tile. 1 undatable prehistoric flint end scraper, 1 ?retouched thermal flake and 1 worn flake. 3 medieval pottery sherds (2 unglazed, 1 glazed) and 1 glazed floor tile (Flemish). 8 medieval/post-medieval pottery sherds (1 stoneware, 7 LMT), 1 brick fragment and 1 malting kiln floor tile. 25 medieval or later flint flakes, flake fragments and spalls. Also likely to be relatively recent knapping waste. 3 post-medieval clay tobacco pipe stem fragments. 4 undatable lead fragments, 4 iron nails, 1 clinker lump and oyster shell. 2 ?prehistoric flint flakes with irregular retouch/edge damage. 4 medieval pottery sherds (3 unglazed, 1 glazed Grimston) and 2 window glass fragments (1 painted). 1 medieval/post-medieval pottery sherd (stoneware) and 4 brick fragments. 1 ?medieval/post-medieval pottery sherd (?LMT). 20 medieval or later flint flakes, flake fragments and spalls. Also likely to be relatively recent knapping waste. 2 post-medieval pottery sherds (Glazed Red Earthenware). 5 undatable iron nails, 1 iron strip fragment and 1 slag lump. 1 prehistoric retouched flint flake and 1 flake. 2 ?prehistoric plunging flint flakes with retouch/edge damage. 5 medieval pottery sherds (4 unglazed and 1 glazed Grimston), 1 brick and 2 window glass fragments. 7 medieval or later flint flakes, flake fragments and spalls. Also likely to be relatively recent knapping waste. 2 medieval/post-medieval buckles, 3 pottery sherds (1 stoneware and 2 LMT) and 4 roof tiles. 2 post-medieval pottery sherds (Glazed Red Earthenware), 2 pantiles and 1 clay tobacco pipe stem. 1 undatable lead window came, 4 iron nails, oyster shell and mussel shell. 1 ?prehistoric serrated flint flake. 2 medieval pottery sherds (1 unglazed and 1 glazed regional import) and 1 brick fragment. 3 medieval/post-medieval pottery sherds (2 LMT, 1 stoneware) and 4 roof tiles. 4 medieval or later flint flakes, flake fragments and spalls. Also likely to be relatively recent knapping waste. 2 undatable iron nails, oyster shells and mussel shells. 1 Mesolithic microlithic flint blade. 2 medieval pottery sherds (1 unglazed, 1 glazed), 2 bricks and 7 roof tiles. 3 post-medieval pottery sherds (2 Glazed Red Earthenware and 1 iron glazed) and 1 clay tobacco pipe stem. Undatable oyster and whelk shells. Flints identified by P. Robins (NCM) and other objects by A. Rogerson (NLA). See list and map in file. A. Rogerson (NLA), 11 May 1994. Amended by P. Watkins (HES), 4 June 2014. Gatehouse, windpump and church visible. October 1994. Building Survey and Earthwork Survey. Archaeological and architectural survey of St Benet's Abbey by RCHME. See report (S22) for plans and further details. P. Watkins (HES), 20 February 2014. 7 January 1995. Young Archaeologists' Club fieldwalking. Areas previously used by Norfolk Archaeological and Historical Research Group. Flints, medieval to post medieval sherds and tile. Around 1996. Casual find in molehill. English Heritage geophysical resistivity survey. Dry conditions prevented identification of monastic buildings. A possible wall footing was recorded. See report (S9) for further details. 8 April 1997. NLA air photography. Remains of gatehouse and windpump still visible. Foundations of church and earthwork showing clearly. 5 May 1998. Riverbank survey. Photographic survey of riverbanks to assess impact of erosion. November 2001. Found in molehill within sanctuary of Abbey church. Remarkable rune inscribed lead plaque. See description, (S8) and (S11) in file. D. Gurney (NLA), 6 December 2004. See (S14) for details of a management plan drafted by the Norfolk Archaeological Trust in 2004. Scheduled monument consent granted concerning the strengthening and restoring of height to the flood bank around the edge of the site. H. White (NLA), 20 March 2009. June 2003 - June 2006. Earthwork survey. A five-day earthwork survey was undertaken by undergraduate students from UEA. For further information on Late Saxon lead plaque with runic inscription. Cropmarks of rectangular buildings and walls are visible at the site of St. Benet’s Abbey on aerial photographs (S18-S21). Extensive earthworks relating to the abbey are also visible on aerial photographs. However, a comprehensive earthwork survey (S21-S22) of the site has been carried out to a greater level of detail and accuracy than would be possible from the aerial photograph mapping. Consequently is was decided that the NMP mapping would be restricted to features not recorded by the earthwork survey. The only additional features to be observed on the aerial photographs were two groups of negative cropmarks relating to the stone foundations of monastic buildings. The first group is located at TG 3833 1552 approximately 80m to the south of the nave of the abbey church (S19-S20). They show a range of buildings on a roughly north northeast to south southwest alignment that is not quite perpendicular to that of the church. A complete building or part of the range measuring 22m long by up to 9m wide is present towards the northern end of the group. It is separated into two rooms measuring 13.5m and 8.5m long. Further negative cropmarks to the north and south of this building appear to represent the walls of a continuation of this range giving it a total length of at least 46m. Part of an apparently detached rectangular building, measuring at least 9m long by 4.5m wide, is present to the east of the main range. The position of these cropmarks does not directly correspond to any earthworks recorded by the field survey (S22-S23). Although the function of these buildings is not known, their position and general alignment indicate that they are likely to form part of the domestic or ancillary buildings of the abbey. The southern part of these cropmarks is crossed by a roughly west to east aligned bank and ditch earthwork (not mapped). This was interpreted as the outer ditch of the inner court of the abbey or a post medieval track leading from The Chequers Inn at its western end (S22). The fact that the linear earthwork appears to cut across the range of buildings visible as cropmarks, suggests that it is not the boundary of the inner court but a later feature, probably a track. The second group of building cropmarks are located at TG 3824 1562 and are associated with a group of buildings at the former Chequers Inn. This building, also known as St Benet’s House, was located on the Bure waterfront of the site and it has been suggested that it incorporated former abbey buildings. The site of the inn itself is not visible as a cropmark but evidence of walls and buildings are present around a yard to its north. The outer walls forming an L-shape on southwest to northeast and northwest to southeast alignments define the edge of a sunken area visible as an earthwork. This appears to represent the yard associated with the inn. These walls partly survive above ground but are only visible as cropmarks on the 1956 aerial photograph (S21). A second wall cropmark runs parallel to the outer wall inside the yard. Internal divisions between these two walls on the northeast side of the yard suggest the presence of a building measuring 22m long by 5.5m wide. More clearly defined is a second building on the southwest side of the yard adjacent to the river. This building may be lies on the line of the inner yard wall and has dimensions of approximately 5m by 3m. A further small structure measuring just over 5m by 3m is present on the outside of the outer yard wall close to the river. It is likely that these buildings were associated with the Chequers Inn and may well have been outbuildings and stables. It is possible that they were originally constructed as buildings associated with the abbey. J. Albone (NMP), 28 March 2007. Revised by J. Albone (NMP), 08 May 2007. Guidebook and history published (S24), including a tour of the abbey precinct and ruins, and a summary of its history. Norfolk Archaeological Trust plan to repair buildings on the site and provide a car park and disabled- friendly paths. Added to the English Heritage buildings at risk register. Scheduled momument consent granted concerning the insertion of a pipe or culvert into the modern fill of a medieval ditch to improve drainage. October 2010. Conservation Management Plan. S. Howard (HES), 15 November 2011. See St Helen's church, Ranworth (NHER 8515) for a misericord showing the gatehouse and mill. D. Gurney (HES), 27 February 2012. Clearance of undergrowth has revealed the precinct wall. See (S31) for discussion of this wall. D. Gurney (HES), 1 April 2013. Interim notes on the mill following internal inspection from the scaffolding erected for repairs (S32). Inside the mill, most of the former holes for the floor beams and joists had been bricked up many years ago, but their approximate positions could be discerned. Judging by the evidence at the top, the cap was centred by a "cap centring frame"; a feature once to be found on some of the older windmills in the area - but no complete examples remain now. It would be valuable if the ground floor inside the mill could be excavated. This might reveal details of the mill's former use as an oil-expressing mill, as foundations for the bedstone might survive. It might also be possible to trace the cog-pit for the pit-wheel from when the mill was used for drainage. D. Gurney (HES), 3 February 2014. --- Aerial Photograph: See list in file. --- Newspaper Article: Eastern Daily Press. 1996. Disasters strike great mills. 24 March. & photo. --- Monograph: Page, W. (ed.). 1906. The Victoria History of Norfolk. The Victoria History of the Counties of England. Vol 2. p 330. --- Aerial Photograph: Edwards, D.A. (NLA). 1994. TG3815/AU, AT, AV, AX - AZ, ABA, ABB. --- Aerial Photograph: Edwards, D.A. (NLA). 1997. TG 3715A; TG 3815ABC - ABP. --- Newspaper Article: 2002. Eastern Daily Press. 31 May. --- Unpublished Document: Bracey, J.W.. 2002. Letter. --- Unpublished Document: Ministry of Works. 1920-1956. PRO REF WORKS 14/1735. --- Illustration: Rose, E.. Annotated plan. St. Benet's Abbey, Horning. --- Monograph: Cushion, B. and Davison, A. 2003. Earthworks of Norfolk. East Anglian Archaeology. No 104. p 148. --- Correspondence: Thompson, M.W.. 1959. Letter and report. Norfolk, Scheduled Monument No. 6 - St Benet's Abbey, Horning. --- Newspaper Article: 1987. Eastern Daily Press. 19 May. --- Newspaper Article: 1986. Eastern Daily Press. 24 August. --- Map: Nicholson, R.. 1702. Detail from map of St Benet's Abbey. --- Newspaper Article: 1978. Eastern Daily Press. 22 July. --- Newspaper Article: 1980. Eastern Daily Press. 5 June. --- Newspaper Article: 1983. Eastern Daily Press. 21 November. --- Newspaper Article: Eastern Evening News. 1973. 1 November. --- Photograph: Coe, A.. 1900. St Benet's Abbey. --- Illustration: E.P.L.B.. 1879. Plan of the Remains of the Abbey Church of St Benet at Holm. July. --- Map: Rowe, R.. 1991. National Rivers Authority Anglian Region. Plan of defence closure and work for English Heritage. --- Correspondence: Edwards, D.. 1988. Letter and photographs. St Benet's Abbey, Horning, Norfolk. Flooding concern.. 7 May. --- Photograph: 1956. St Benet's Abbey gatehouse. --- Illustration: Williamson, T.. Earthwork survey. St Benet's Abbey. --- Publication: Snelling, J.M. and Edwards, W.F.. 1971, 1983. St. Benet's Abbey, Norfolk. --- Newspaper Article: 1996. Eastern Daily Press. 19 October. --- Photograph: 1950. St Benet's Abbey, Horning. --- Unpublished Document: Rogerson, A.. 1998. St Benet's Abbey River Edge Remedial Works. 19 January. --- Map: RCHME. 1994. RCHME plan. St. Benet's Abbey..
--- Article in Serial: Journal of the British Archaeological Association. Vol XXXVI, p 15. --- Newspaper Article: 2006. Eastern Daily Press. 21 October. --- Publication: Knowles, D. and Hadcock, R. N. 1971. Medieval Religious Houses of England and Wales. pp 56, 75. --- Newspaper Article: Eastern Daily Press. 2010. How a tumbledown abbey was transformed by Cotman's light fantastic.. 7 August. --- Leaflet: 1971. St Benet's Abbey, Norfolk..
--- Newspaper Article: Eastern Daily Press. 2010. Plans to enhance a Broads landmark.. 15 November. --- Monograph: White, S.. 2008. Revealing St Benet's Abbey's Hidden History: Plan for the interpretation of St Benet's Abbey, Horning, Norfolk..
--- Newspaper Article: Eastern Daily Press. 2012. Abbey ruins to benefit from £671k lottery grant. 16 March. --- Newspaper Article: Eastern Daily Press. 2012. Restoration project for iconic abbey. 14 June. --- Article in Serial: Gurney, D. (ed.). 1996. Addendum to Excavations and Surveys in Norfolk 1994. Norfolk Archaeology. Vol XLII Pt III p 412. --- Archive: Clarke, R. R. and NCM Staff. 1933-1973. Norwich Castle Museum Record Card - Late Saxon. Horning. --- Archive: Clarke, R. R. and NCM Staff. 1933-1973. Norwich Castle Museum Record Card - Medieval. Horning . --- Photograph: BDF 18, ELA 13-29, ELB 1-6. --- Newspaper Article: Eastern Daily Press. 2008. In search of icons true past. 22 March. --- Newspaper Article: Eastern Daily Press. 2004. Abbey ruins were disturbed. 5 March. --- Newspaper Article: Eastern Daily Press. 2004. Undisturbed history. 27 February. --- Archive: Clarke, R. R. and NCM Staff. 1933-1973. Norwich Castle Museum Record Card - Post-Medieval. Horning. --- Newspaper Article: Eastern Daily Press. 2013. Spotlight on the buildings that open. 10/10/2013. <S1> Map: RCHME. 1994. RCHME plan. Gatehouse, St. Benet's Abbey..
<S3> Illustration: Unknown. 1982. Drawing of an early medieval T-shaped woodworking axe.. Card. 1:1. <S5> Correspondence: Timm, N.. 1968. Letter and plan. St Benet's Abbey. Examination of riverside structures..
<S6> Map: Whittingham, A.B.. 1961. The Abbey of St. Benet's at Hulme in Horning Norfolk. <S7> Photograph: Rose, E.. BCF 8. Wall facing beneath north nave wall of St Benet's Abbey. <S9> Unpublished Contractor Report: Linford, P. 1996. The Abbey of St. Benet at Holm, Horning, Norfolk. Report on Geophysical Survey. English Heritage Ancient Monuments Laboratory. 71/96. <S10> Photograph: Wicks, D.. 1998. St Benet's Abbey Riverbank Photographic Survey. <S11> Unpublished Document: Hines, J.. 2003. Letter and report. St Benet's Abbey runic inscription. <S12> Unpublished Document: Williamson, T.. 2002. Report for Broads Authority. <S13> Unpublished Document: Broadland Environmental Services. 2004. Broadland Flood Alleviation Project. Compartment 5. Erosion protection works for St. Benet's Abbey. <S14> Unpublished Document: Norfolk Archaeological Trust. 2004. St Benets Abbey, Horning, Norfolk. Draft Management Plan. <S15> Scheduling Record: DCMS. 2006. Scheduled monument consent. <S16> Unpublished Document: Hoggett, R.. 2004. Landscape III summaries for the Norfolk Historic Environment Record. <S17> Monograph: Barnes, M.P. & Page, R.I.. 2006. The Scandinavian Inscriptions of Britain.. pp 109-111. <S18> Vertical Aerial Photograph: Meridian Airmaps Limited. 1962. MAL 62538 102291-2 28-JUL-1962 (NMR). <S19> Vertical Aerial Photograph: Ordnance Survey. 1990. OS/90224 163-4 31-JUL-1990. <S20> Oblique Aerial Photograph: CUCAP. 1976. CUCAP (BYY69-72) 03-JUL-1976. <S21> Oblique Aerial Photograph: CUCAP. 1956. NHER TG 3815ABV (CUCAP SP74) 28-MAY-1956. <S22> Unpublished Contractor Report: Royal Commission On The Historical Monuments Of England. 1994. The Abbey of St Benet at Holm, Horning, Norfolk. An Archaeological and Architectural Survey. Royal Commission on the Historical Monuments of England. <S23> Map: RCHME. 1994. RCHME plan. St. Benet's Abbey. Bure Waterfront..
<S24> Unpublished Document: Pestell, T.. 2008. St Benet's Abbey A Guide and History..
<S25> Newspaper Article: Eastern Daily Press. 2008. Trust Reveals Its Plans To Restore Historic Abbey. 12 July. <S26> Newspaper Article: Eastern Daily Press. 2010. Trust is hoping to unlock isolated abbey's potential. 16 January. <S27> Newspaper Article: Eastern Daily Press. 2008. Several newcomers to heritage at risk register. 10 July. <S28> Scheduling Record: DCMS. 2008. Scheduled Monument Consent. <S29> Unpublished Document: Norfolk Archaeological Trust. 2011. 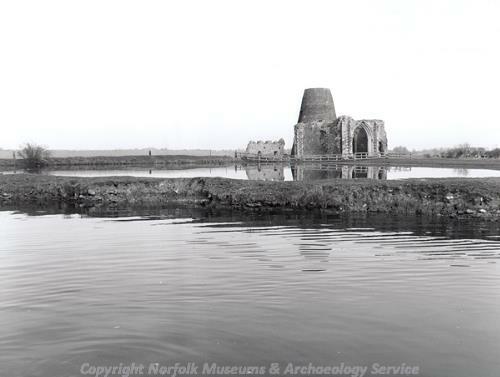 Conservation management plan for St Benet’s Abbey, Horning, Norfolk.. October. <S30> Newspaper Article: Eastern Daily Press. 2012. Graffiti gives insight into abbey's history. 29 September. <S31> Unpublished Document: Heywood, S.. 2013. The Precinct Wall of St Benet’s Abbey, Horning, Norfolk..
<S32> Verbal Communication: Vincent Pargeter. 2014. Interim report on the mill.